Did you hear? The folk revival is over. So, dust down your Ramones t-shirt baby, dig out that Nirvana smiley, and listen to the Pixies again, because oh yes the future is here man and it looks a lot like before: awesome. Ok, not quite, but floating around this pop radar are bands that look like the best parts of garage rock past. 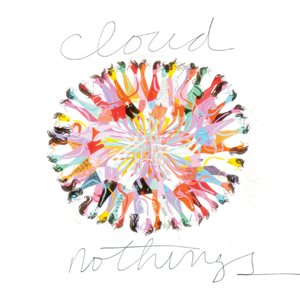 Cloud Nothings are no exception, but also exceptional. They are, quite literally, multi-instrumentalist and all round indie-pop-prodigy Dylan Baldi. A mere 18 years old, Dylan recorded his first lo-fi offering in the rock’n’roll location of his parent’s basement. With the chance to support Woods and Real Estate he persuaded his Mum and Dad to stop majoring in audio recording and set off with a full band. Having released EP Turning On, Cloud Nothings is the first full album recorded in a ‘proper’ studio. See him on the road and you’ll see Duke (bass), Gerycz (drums), and Boyer (guitar) as well, yet this recording is all his own work. First single ‘Should Have’ picks up where Turning On left off, with a (now) studio-refined sound it falls squarely between power pop and surf rock, all catchy hook and sunshine melody. A trick repeated on ‘Nothing’s Wrong’ and ‘Heartbeat’, these are sugary sweet songs storming along like Silver Sun on fast forward. Delve further and you’ll find a more sophisticated and mature centre, drawing upon the best of American indie from the 80s, 90s and noughties. If you judge an album by its comparisons, then judge this thus: ‘Rock’ is akin to the Ramones; ‘Forget You All The Time’ is The Smashing Pumpkins meeting Frank Black; ‘You’re Not That Good At Anything’ mixes the Pixies with Nirvana; and lead track ‘Understand At All’ sounds like a younger version of the late Jay Reatard. All of these are urgent abrasive and full of attitude, yet hook laden and melody driven, with chant along choruses and instant familiarity. No easy task but this boy has an ear for it.